Farmers Market, I Am Ready for You! Today is the opening day of the farmer’s market in my little community. I don’t know if that makes it the number-one happiest day of the year, but it’s certainly in the top ten. Not only does this mean that we’re maybe safe from winter weather (maybe – it does snow in May sometimes, but only sometimes), but it also means the beginning of good summer meals. I mean, the difference between a summer tomato from the farmers market and a winter tomato from the grocery store — are these even the same vegetable? And how about a peach that ripened on the tree versus one from the grocery store that crunches like an apple when you bite into it. Ugh. That crunchy hard peach is an insult to real peaches everywhere. So today it was slim pickings — asparagus, mushrooms, eggs, but I arrived too late for rhubarb, sob. Next week! My favorite farmer from Michigan assures me he’ll have early strawberries next week, too, and told me to get there early. I remember last year, the first week he had strawberries, they were completely sold out by 10:00 a.m. So I’ll be setting my alarm for sure. This same farmer has the best eggs, too, and so tonight’s dinner will be an egg white omelet with asparagus and a bit of porcini mushroom. Yum. I already can’t wait for dinner. Because really, if ever there were plums that deserved a poetic tribute, it was those tiny plums from the farmers market in Indianapolis. 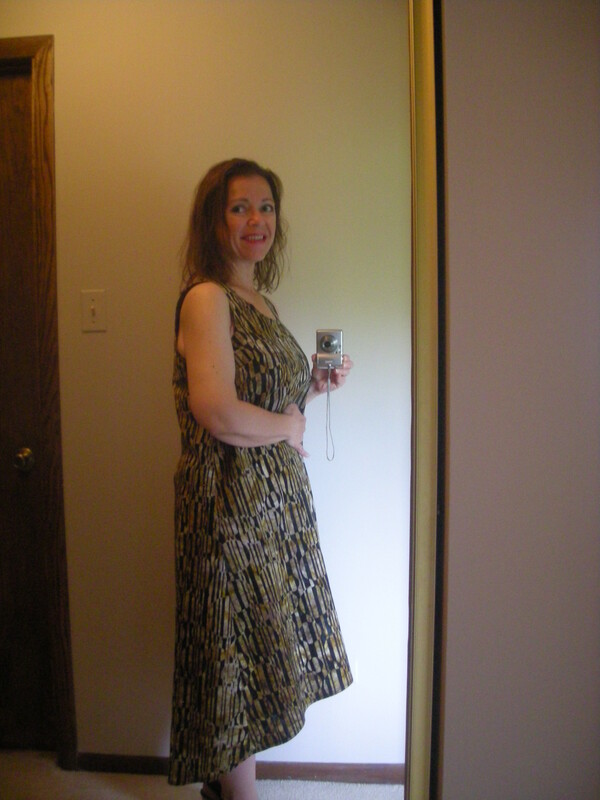 This dress is very loose and billowy, a trapeze shape with a mullet hem. 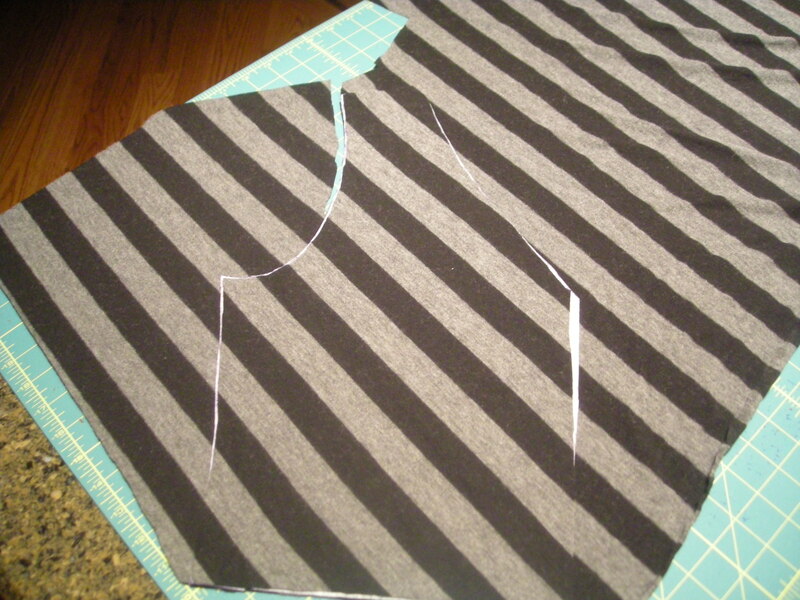 It’s very simple, just a center front seam, center back seam, side seams, and bust darts. Sometimes the simplest shapes are the ones that require the most fitting, though. I labored over this one. I think the key to a good fit with a shape like this is in the shoulders and upper bust. If you nail the fit there, the rest of the dress can be loose but it won’t appear oversized. So I tinkered quite a lot with the shaping in that area, and I ended up taking it in about 2″ in the shoulders and 3″ in the upper bust. I wanted something loose and breezy because I’ve been dealing with medication changes since about October, and each change causes a change in weight. I’m up, I’m down, and it’s driving me a little crazy. So I thought a dress like this might help me cope while we get things stable again. Right now, I’m probably up about 16 or 17 pounds from where I was when we started with all this tinkering (but last week, I was only up 11 — really, the fluctuations are frustrating), and as we all know, every stone (14 pounds) is a size. But I know my shoulders won’t change shape much, so a dress that’s fitted well through the shoulders and loose everywhere else might still be wearable after I’m out of this phase. Here’s a view of the side to show off the hem shaping. As I was snapping some side views, I started thinking about how I might tinker with that waistline after things are stable again. The pattern, Simplicity 1621, has a tank top version of this same piece with elastic at the high waist, and I might add some elastic later. I originally purchased this pattern to make the jacket from some black silk organza. It was pure coincidence that I was thinking about this black and gold batik from The Needle Shop and spotted this mullet dress — and just like that, my planned black and gold batik kimono became a sundress. The sizing on this pattern is S, M, L, etc., instead of numbered sizes. I normally expect a Medium to be the equivalent of a 12-14, which is just where I am now — 12 on a normal day, 14 when I’m puffy. But this one is a little different, and the medium is a 14-16. That’s why it required so much tinkering in the shoulder shaping. It was definitely as broad as a loose 16 should be, but I wanted more of a 12 in that area. The only other adjustment was my standard FBA. I didn’t even shorten them length. If I make this one again — and I might, in a smaller size out of a knit fabric instead of a woven — I might narrow the shoulder straps a bit. I don’t think they’re too wide, necessarily, but I think they would look fresher and more modern if they were just a bit narrower. There’s something almost tiger-like about that print, don’t you think? Here’s a better view of the print. It’s batik, black over a sort of marbled gold and brown in a pattern of circles and lines, but from a distance, it almost has an animal print vibe. I like animal prints, so I’m good with that. I don’t ordinarily wear these autumnal gold and brown shades — and looking through the photos, I realized that my standard silver jewelry looks wrong with this, so I’ll probably wear some black onyx earrings with it next time. And I think there’s enough black in the print that the golden tones don’t wash me out, but maybe that’s wishful thinking. I’ll wear the dress in either case! What’s your favorite thing from the farmers market? I don’t know about you guys, but I find cutting and sewing to be two very different types of activity. Each feels like a separate sort of creative process. They’re both satisfying, but because of the differences between them, I want a different mood and a different mindset for each. When I’m cutting, it feels a bit like puzzling through a planning stage. I trace all my patterns, and then I make alterations on the tracings based on the actual measurements at certain critical points like shoulder and bust and waist. So a lot of decisions have to be made here that will affect the final garment. How much wearing ease do I want, and wear do I want it? I’ve been sewing long enough that I don’t have to really ponder these decisions most of the time, but sometimes these can be tricky calls. This is also where I’m learning how a particular fabric will behave. It doesn’t matter how long you’ve been sewing or how many times you’ve knit with other versions of a fabric. No two rayon jerseys, for example, will behave in exactly the same way. Cutting the fabric lets me start to get to know it and think about how I might need to adjust the construction methods to accommodate different characteristics. So I like cutting, but it feels more cerebral than sewing, which I find almost mindlessly soothing by comparison. And this is one of the main reasons I tend to cut things in clusters, several projects at once. When the mindset is there, and I have a bit of time for it, it makes more sense to knock out a bunch of cuts at once. And as long as I’m pulling out the mats, French curves, tracing materials, etc., I might as well make good use of them. This past weekend, I cut out three new projects for summer. The first is a white mesh baseball jacket. The cuffs, collar, and front band will be in white cotton ribbing. I had to do quite a lot of puzzling and thinking to figure out how to adjust the pattern to accommodate the mesh — eliminating the lining and pockets, for example — but for the most part, this pattern is better suited to this task than any other jacket pattern I looked at. This will be one of those things I can toss on over jeans and a tee or over a sundress, and it will work easily with any casual style. Side note: I’m really taken with mesh lately. Don’t know why. Mood had some really nice ones and I snapped up two, this white one and the black bonded mesh knit I used to make the tunic I blogged about last week. This white mesh is heavier, with a denser drape, and I think the cotton ribbing will give it good structure. I also cut a cotton batik sundress with a mullet hem. This one required a bit more pattern adjustment prior to cutting — it’s really, really loose. I wanted it sort of skimmy and loose, rather than just a big cotton sack, so I tried to narrow it through the shoulders and reshape the upper bust. I’ve already started sewing this one, and I still need to take it in a bit through the shoulders, but it’s going to work out pretty much as planned. I love this print, a deep stash length from the Needle Shop. I usually shy away from browns and golds, but this one had to come home with me as soon as I saw it. 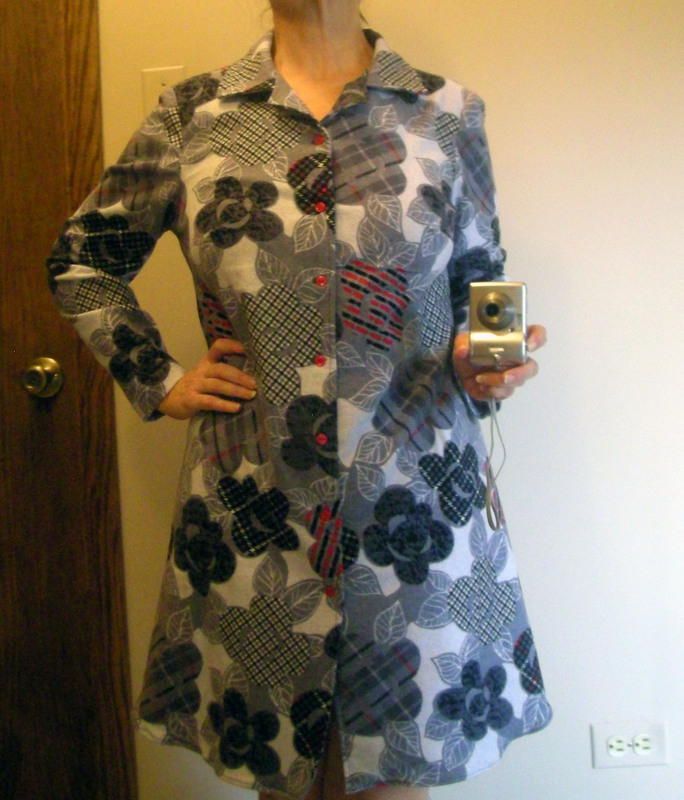 Finally, I cut a jersey maxidress in a striped knit from Fishman’s that was originally intended for a much different project. I’d thought to make one of those folded, crossover drape front blouses with it, but then I tried one on in the store to see how it would look on my figure. It was awful. I looked pregnant and drowning in fabric. So I decided to make a summer maxi out of this fabric instead. This had to be cut in a single layer to make sure the stripes matched just so. My trick for cutting patterned fabric is to always cut in a single layer and lay the first piece on top of the fabric to cut the second piece. This guarantees that all the matching points will match. In this case, because everything had to be cut on the bias, it took a little extra time and care, but my cutting trick always works pretty well. If you look closely here, you can see the white outline of the pattern piece under the first bodice piece that I already cut. 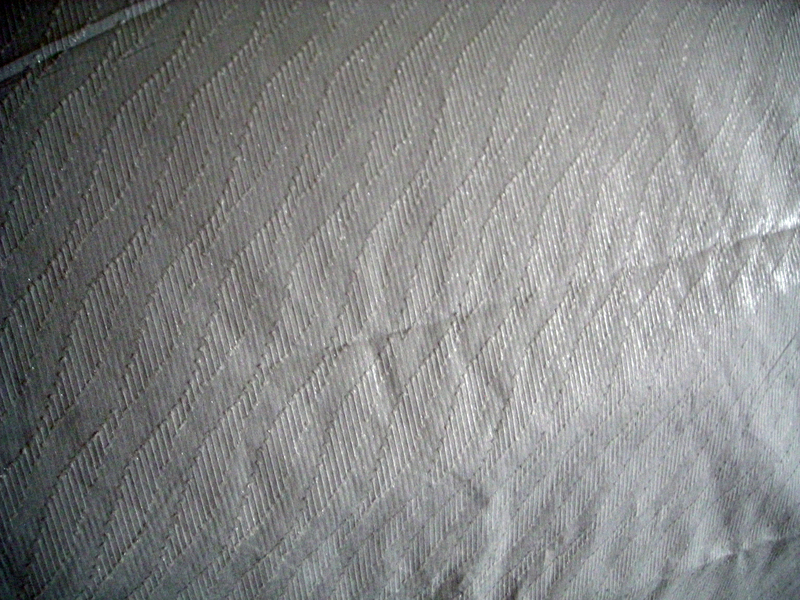 It’s a little hard to see because the patterns are matched along the cut edges. 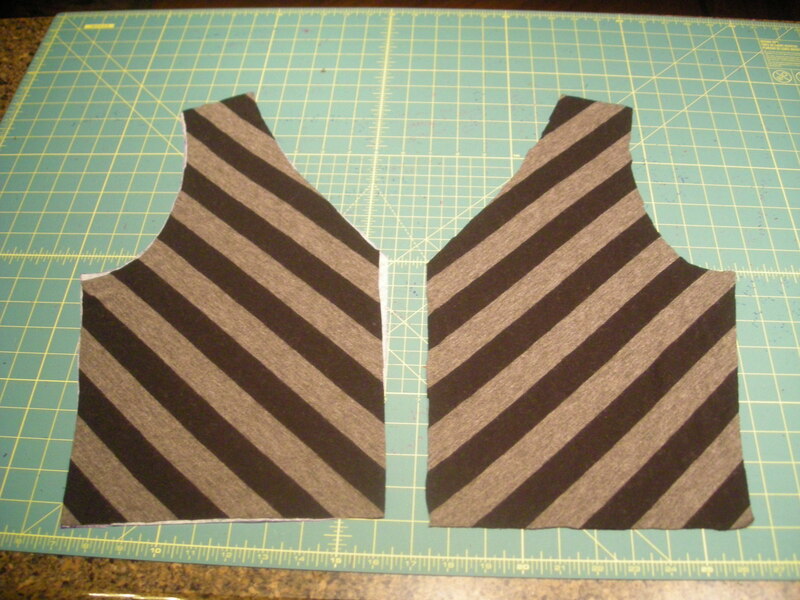 And then, after cutting, this is how the two bodice fronts look, right side up and side by side. That’s a pretty good match. I’ll have to be careful during seaming to make sure the stripes align properly, but it shouldn’t be too hard to make it work. So this is my first batch of warm-weather sewing for the year, yay! I can tell I’m antsy for summer because every time I look at my pattern stash, the sundresses are the only things that appeal to me. Nothing beats an easy, soft summer dress! I can’t wait to wear them! Are you ready for some heat waves? Right before the holiday, one of my favorite local fabric shops, The Needle Shop, had a big sale on the same day when, by coincidence, I had already planned to be in their neighborhood. So of course, that was my excuse. They don’t have a lot of sales, just a few days a year here and there, so I do try to hit them on those days. Their fabrics are excellent, and they have done a good job extending their selection from all craft and home dec fabrics to a blend of these and garment fabrics. It’s a well curated collection in a small shop, the clerks are delightful people, and I’ve always been very happy with anything I get from them. This time, I bought a couple of poly ponte knits and a sandwashed rayon twill. I’m enough of a fiber snob that I rarely sew with rayon or poly, but these fabrics felt great, looked great, and seemed worth the risk. 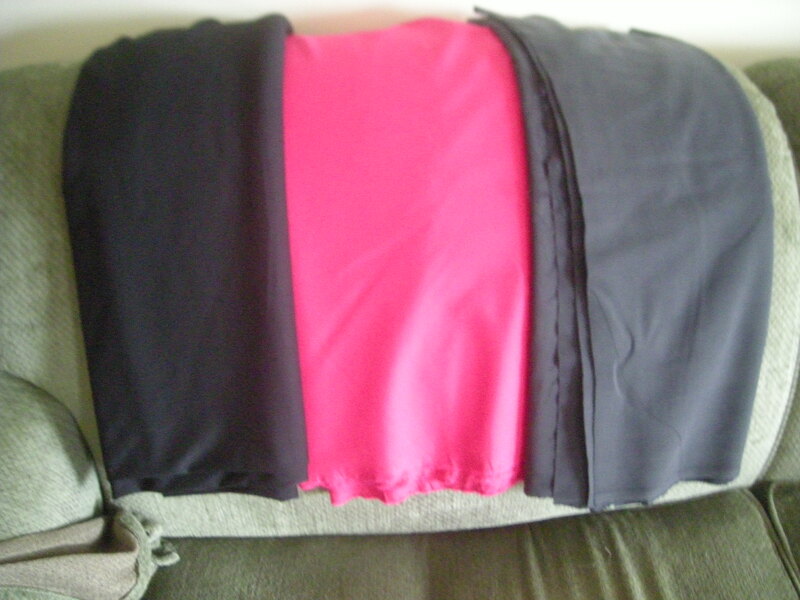 From left to right, black ponte, pink ponte, gray twill. I also bought a small piece of this dotted swiss because I’ve never seen anything quite like it before. This textile really hates the camera, and this is the best photo I could manage. You can see that the dotting is in a wave pattern (instead of in a grid, like typical swiss dot), and there is a metallic thread woven into the pattern. The color is a very pale gray, almost an oyster gray, but the tone shifts depending on how the light hits the metallic threads. You can see just a bit of that effect in this photo. It’s not iridescent, but just a hint of pearly sheen here and there. 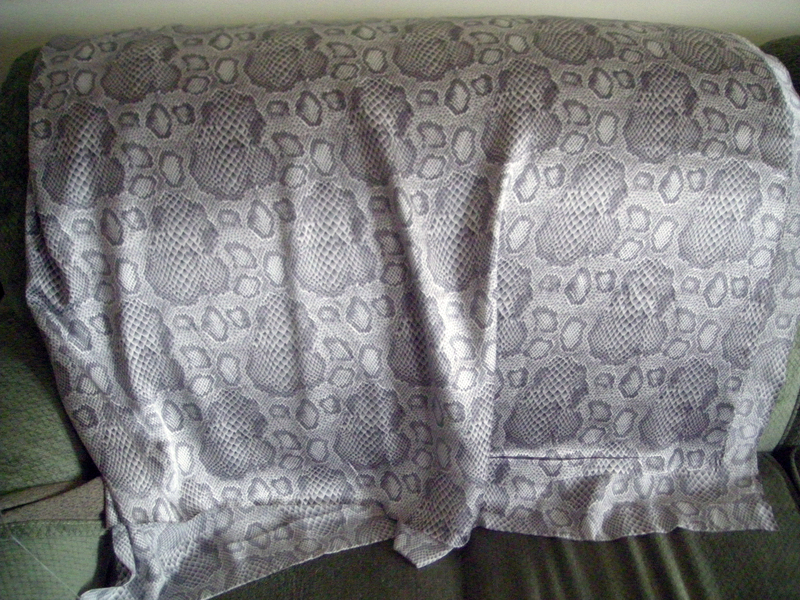 Then, because I was already buying fabric, what the heck, I stopped at Fishman’s — which is nowhere near any of the other places I had to go that day, but whatever, I was in a groove — and bought this silk snakeskin charmeuse I’d been dreaming about ever since I first saw it. This stuff is crazy gorgeous, almost like liquid silver. I wish you could reach through the computer and touch it — even by silk standards, this fabric is incredible. I knew it wouldn’t linger for long, and it had already been a couple weeks since I’d spotted it, so I was worried it would be gone before I could buy it. I rarely have those kinds of feelings about fabric, but this one just was unforgettable. And sure enough, the bolt was nearly empty. I bought the last two yards and felt lucky to do so. It’s just enough to make this blouse, Vogue 1323, but I won’t let myself cut the muslin until after I finish some other projects already on the go. Working with this silk will be a reward for getting through some of these other things. I know, it’s bordering on lunacy to think of working with silk charmeuse as a reward for anything other than bad behavior, but I really look forward to the challenge, and I have my fabric stiffener out and ready for the day I get to cut into this lovely stuff. So, from the stash-busting meters, this puts my current totals at 12.125 in / 22.5 out since 12/1/2014. That’s pretty close to my planned ratio of 1 in / 2 out, and if I ever hem the navy skirt, its 1.5 yards will get those numbers almost perfect. I live in a place with an extreme climate. Our heat index climbs over 100F in the summer and can easily dip as low as -25F or below with wind chills in the winter. My house gets cold in the winter. It’s inevitable. And this means warm textiles sewn into warm garments. Like this nightshirt. 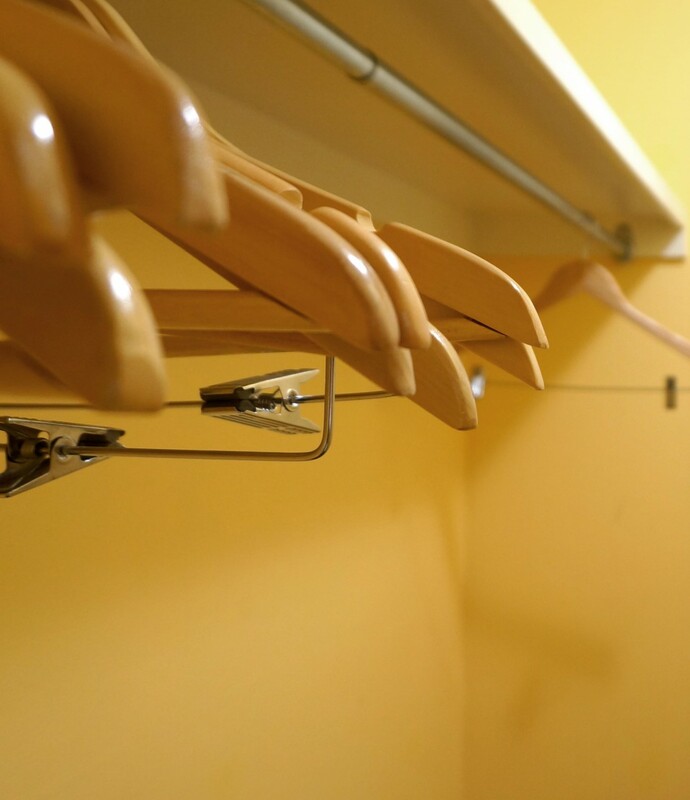 This is a garment with a purpose more than it is a garment with a fashion point of view. Or wait. Maybe the point of view consists of, “Even with flannel sheets and down comforters, this bed is effing freezing.” Is that a fashion point of view, you guys? Does that count for style points? Fashion point of view: Brrr! Yeah, probably not. The entire virtue of this garment is that it is warm. It’s a heavyweight flannel, very good quality stuff from The Needle Shop (link*). One touch of this flannel on the bolt, and I bought a length of it without a care for the print. It’s that good. The weight and weave are top quality, and it has become increasingly difficult to find flannel of this quality in sewing stores. If I do happen upon some, I buy it. Worst case scenario, it can be used to interline a jacket for an extra layer of warmth. Or it can be used to line jeans. Or, as here, it can be used to wear to sleep. I’ll have my eyes closed. It won’t matter what I think of the print. Truthfully, I’m not a big fan of prints in general. I think they add volume to a figure. I briefly toyed with the idea of making a fitted flannel shirt out of this print, but that thought was fleeting. The pattern scale is all wrong, too oversized for my petite frame, even if I do like the color palette. And it is a good color palette. The little flashes of red really wake up the gray, enough so that I decided to use red shirt buttons, too. 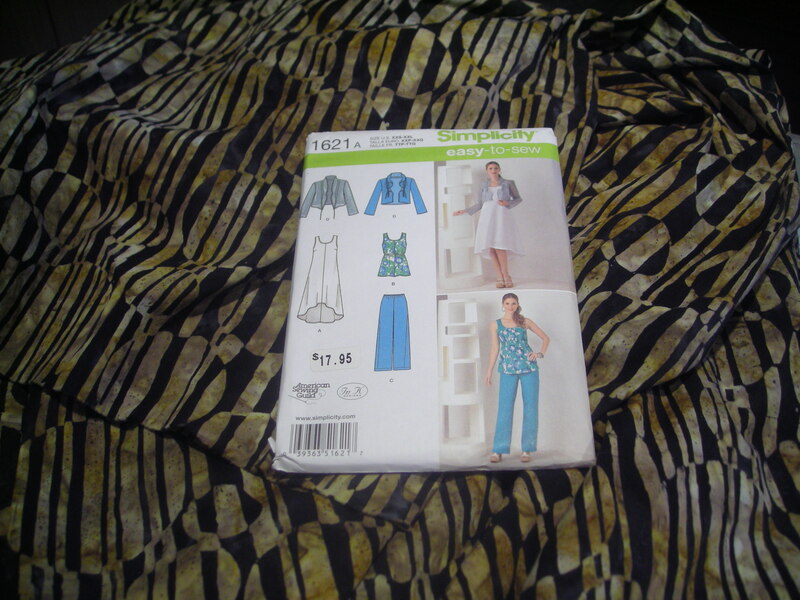 The pattern is McCall’s 6249 (link*), which I’ve used several times now to make pajama pants. View C, the nightshirt, comes with bust sizing, so that spared me from having to make a muslin. Normally, for anything that has to go over my shoulders and bust, I would make a muslin first. But for a nightshirt where fitting doesn’t have to be perfect, and one that came scaled to a D cup, I figured I could make it work. If this had been a regular shirt pattern, I still would have made a muslin, and I likely would have increased the bust just slightly and narrowed the shoulders just slightly. But for a nightshirt, the fit is acceptable as it is. This pattern is rated easy, and with good reason. The sleeve is in one piece with no plackets or cuffs, just a turned and stitched hem. The collar is in one piece — the pattern drawings almost make it look like a two-piece stand collar, but it’s not. It’s one piece. The hardest part, if it can be called hard, were the buttonholes. The automatic buttonholer on my machine is not very user-friendly, so I considered making hand-stitched buttonholes. This is the difference between a nightshirt for private wear and a regular shirt for public wear — I skipped the work of a hand-stitched buttonhole and ended up with some rather Becky Home-Ecky machine made buttonholes, but that’s okay. I don’t mind a shortcut like this for something that very few people will ever see up close. So, that’s one warm flannel nightshirt just as the temperatures start to fall. That will help me stay a bit warmer on a cold night. Hey, I should tell you my favorite trick for winter bedtimes — use the blow dryer to warm the sheets. You just lift the sheets and comforter, aim the blow dryer between them for a few seconds (not too long, and keep it moving — you don’t want to ignite anything), and then the bed will be warm when you get into it. I love this trick. I learned it from my Minnesota cousins who lived in a house with no heating on the second floor where all the bedrooms were located. Think about that. Minnesota. No heating on the second floor. If anybody knew how to beat the cold bed syndrome, it was those cousins. I have some other “OMG my house is freezing” sewing in progress right now. Utilitarian stuff, but I’m in wardrobe-building mode, and these kinds of garments are needful things. What is your favorite trick for staying warm in winter? I am fortunate enough to live a short train hop from the Art Institute of Chicago, one of the world’s truly great museums. I take advantage of this fact a couple of times a year. When I was in my moody, hormonal teenaged phase, in fact, the museum was an escape hatch for me. Hop the train, flash my student ID and museum membership card, and I could spend an afternoon reminding myself of all the beauty in the world. It was soothing, and it was wordless — an important attribute of any escape for a writer. Not too long ago, there was a pretty painting in the modern wing that, of course, I can’t find online anywhere. It looked something like this, except all in shades of green. Naturally, I can’t remember the name of the artist or painting, either. 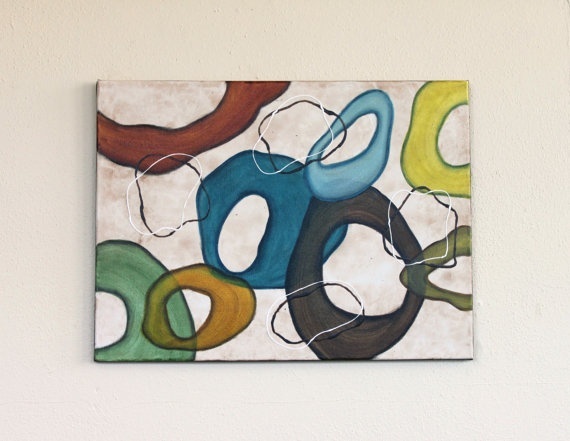 In any case, I liked the painting quite a lot, enough so that when I saw its shrunken-scale near-clone printed on fabric at The Needle Shop, I bought a length in memory of the painting. I didn’t know what I would do with it, but I really liked the print because it reminded me of the painting. It is now my third pair of pajama pants made from the same McCall’s pattern. I realize the run of pajama pants lately is a bit dull, but I’m almost done with them. I’m stopping at four. Three are finished now, and the fourth is cut and awaiting sewing time. These are good things to sew right now because I can make them in my goal-weight size, and I can wear them both now and later. They can be baggier later and still serve their purpose. After the pajama pants are done, I’ll whip up a couple of nightshirts and robes, and that should take care of the lounge wear and night wear for now. Do you find inspiration for sewing projects in places like museums? I bought a length of really excellent flannel from The Needle Shop a couple of years ago.Really excellent flannel is such a rarity these days that even the highly knowledgeable seamstresses at Sewing Pattern Review recently had a discussion about this. There are a few sources, but really, good flannel is hard to find. This is why, when I spotted this superior bolt, I bought two and a half yards without even pausing to consider what I would do with it. And I wasn’t entirely sure what I would do with it — the pattern is a little busy, but not dreadfully so. The gray and red is one of my favorite color combinations, so I knew I would come up with something. At first, I was leaning toward a standard shirt with placket and cuff sleeves, a yoke cut on the bias — your basic lumberjack shirt. But then it let me know it would rather be a nightgown. My house is always cold at night in the winter, and a warm flannel nightgown is always a good thing. 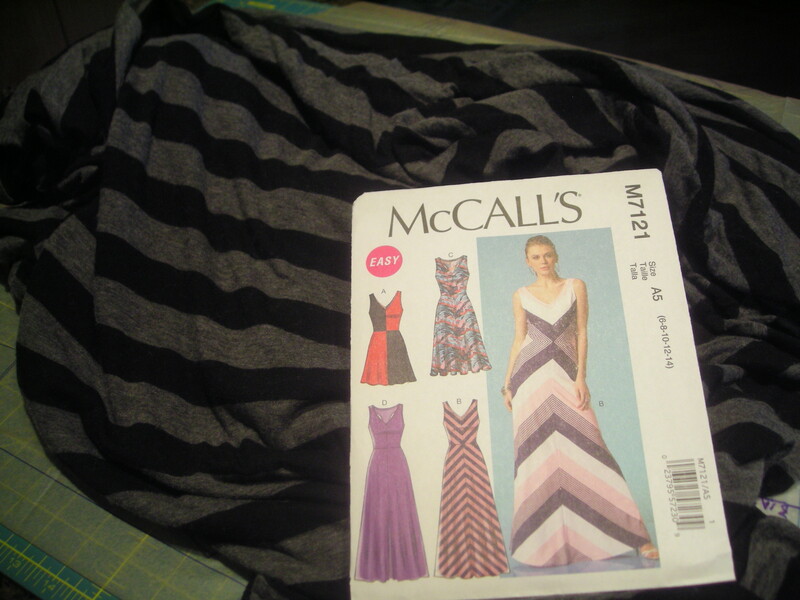 I’m using McCall’s 6249, which also provided me with my go-to pajama pants pattern. I spent a whole entire dollar on this pattern at a JoAnn’s sale, and it is proving to be a dollar well spent. 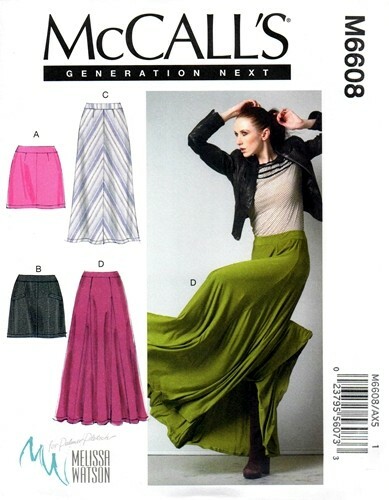 Unfortunately, this pattern is out of print, and I have it in the size 14-20. 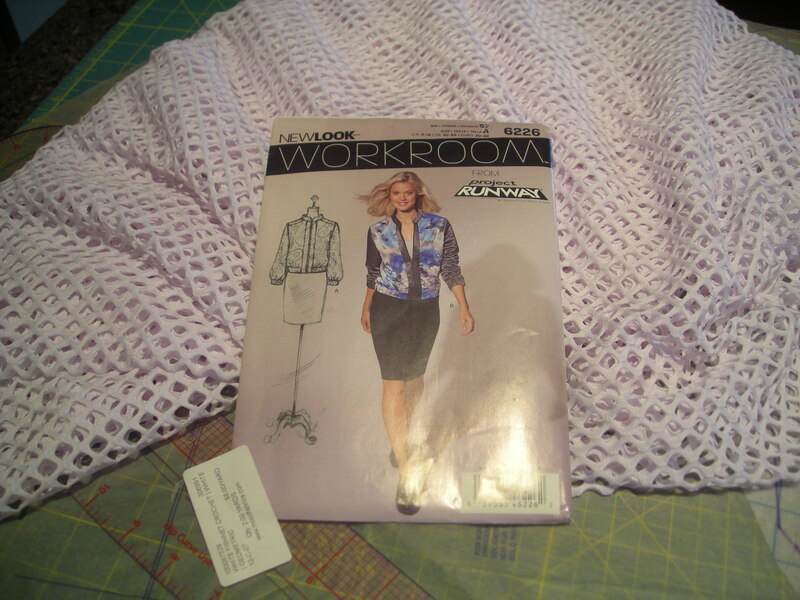 So I have to make the nightgown in a 14, which is a touch big, but it will have to do. 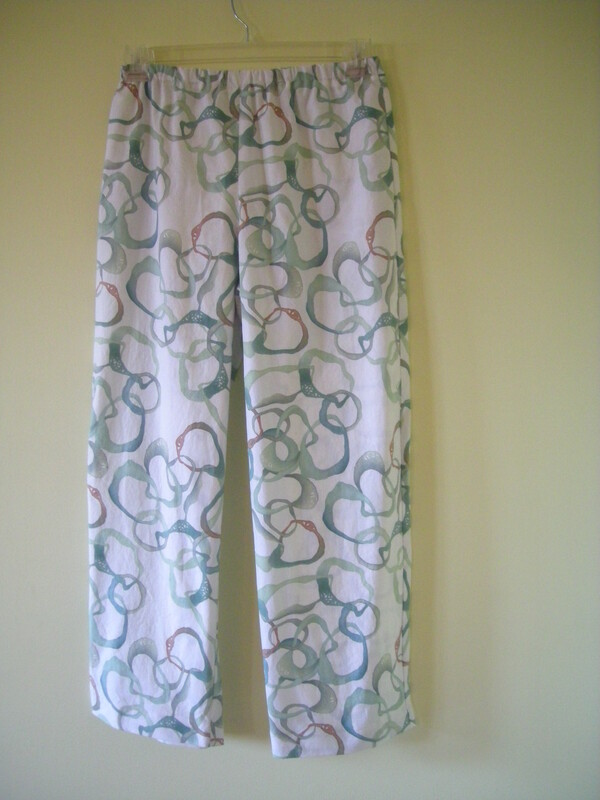 For the pajama pants, I regraded the pattern to make it narrower. But after measuring the nightgown and comparing it to some sleep tees in my drawer, I decided to leave it alone. It will be big, but it will be dramatically smaller than the only other flannel nightgown currently in my drawers, a size XL bought last winter when I was around 50 pounds heavier than my current weight. This new one will be a huge improvement, and the old one is in great shape and will benefit someone at the charity thrift shop. I’ve spent a lot of time cutting and working on a test knit, less time sewing, but I will have two FOs to show you before the week is out. What is your go-to source for good flannel? 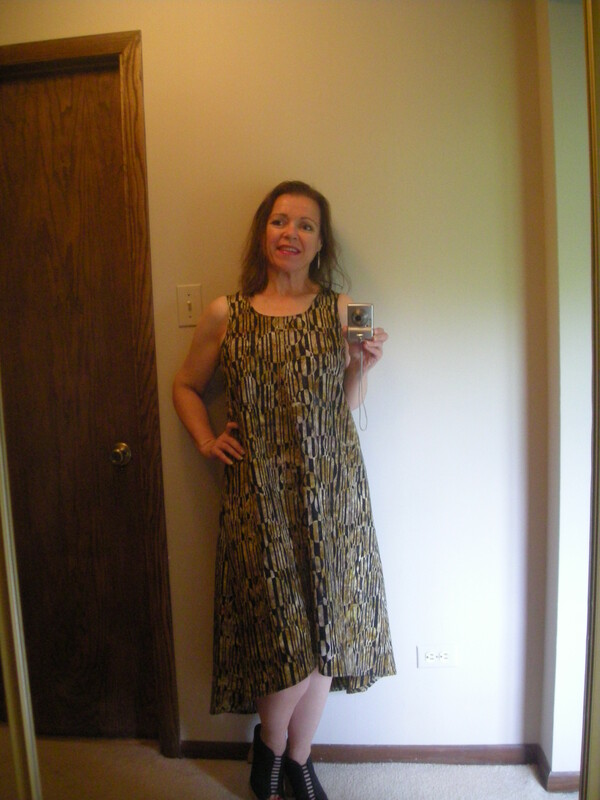 As long as I had McCall’s 6608 out of the envelope for pattern prep, I decided to cut another maxiskirt, this one in an exquisite lawn from The Needle Shop. This tiny but well-curated shop has the best lawns I’ve ever sewn with, as smooth as silk charmeuse, every bit as excellent as a Liberty Tana Lawn, but at less than half the price. This particular lawn had a zigzag stripe that I initially thought I would cut on the bias for View C, the striped skirt on the pattern envelope. I prepped the pattern (shortened it about 5″ at the top of the thigh, that is, and regraded the seams), and then laid it out on the fabric to do some print matching along the seam lines. But the more I looked at it, the less I wanted to cut it on the bias. Something about the zigzags just wasn’t reading right on the bias. So I ended up cutting it on the straight of grain instead. I measured the pieces carefully to be certain I would have enough ease down the length of the skirt to accommodate this change. Bias draping adds a tiny bit of give to the finished piece — not stretch, exactly, not in the same way a knit would stretch. But woven fabrics do stretch a little along the bias, so I wanted to be certain the changed cutting plan wouldn’t result in a too-tight skirt. It should work out just fine. There’s plenty of ease built into this one. When I was first learning to sew, my grandmother taught me a print-matching trick that I find much easier to use than pattern markings. Most matching techniques have you match notches or some similar markings on the pattern piece to the print on the fabric. This technique has you match the fabric pieces instead. In this case, there was a skirt front and a skirt back that needed to be matched along the side seams. I started by cutting the skirt front. I paid attention to where to print lines fell, but only enough to be sure they would fall in a pleasing place on the finished skirt front. Then I laid out the skirt back in an approximation of where I thought the patterns would match, more or less. Next, I took this cut skirt front and laid it on the fabric where I would cut the skirt back, matching the print so that the skirt front laid exactly on top of the print in a nearly invisible match. Here, you can see that the pattern piece (the gridded pellon at the top of the picture) is laid loosely where I think I might cut it — the marker lines on the pellon are the side seams for the skirt back. 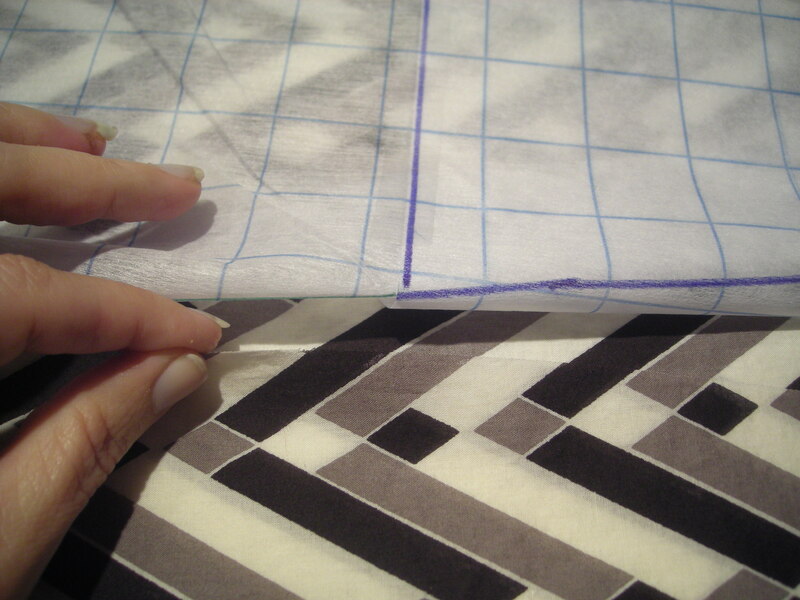 I am matching the cut skirt front (held in my fingers) to the print on the uncut fabric near the seam to match the print. Once the skirt front is laid atop the fabric, you can easily see how the side seams will sew together, and you can lay the pattern piece with a little more precision. 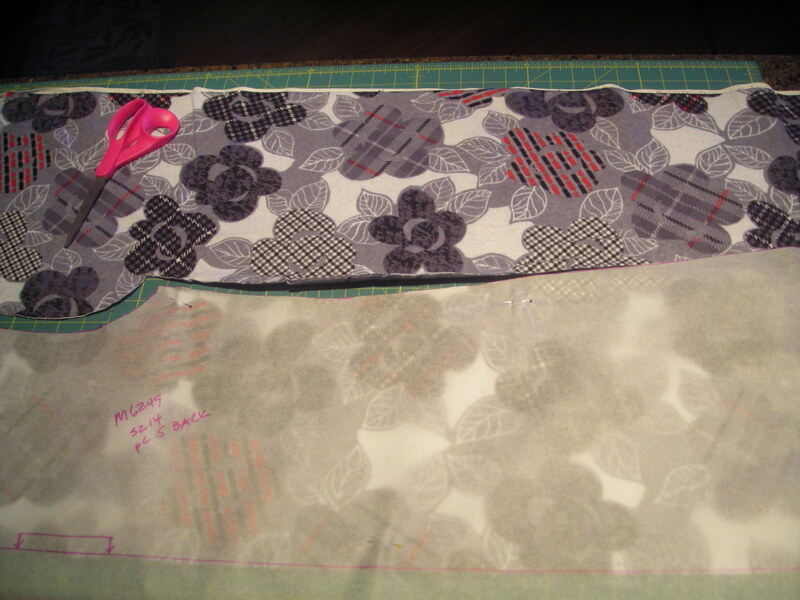 I fold under the seam allowance on the pattern piece to make it even easier to see where the stitching line will fall. Then, once the pattern piece is laid out so that the pattern will match, I remove the cut skirt front piece and cut out the back. This might sound complicated in this description, but I find it infinitely easier — and infinitely more precise — that the normal practice of matching markings on the pattern tissue. 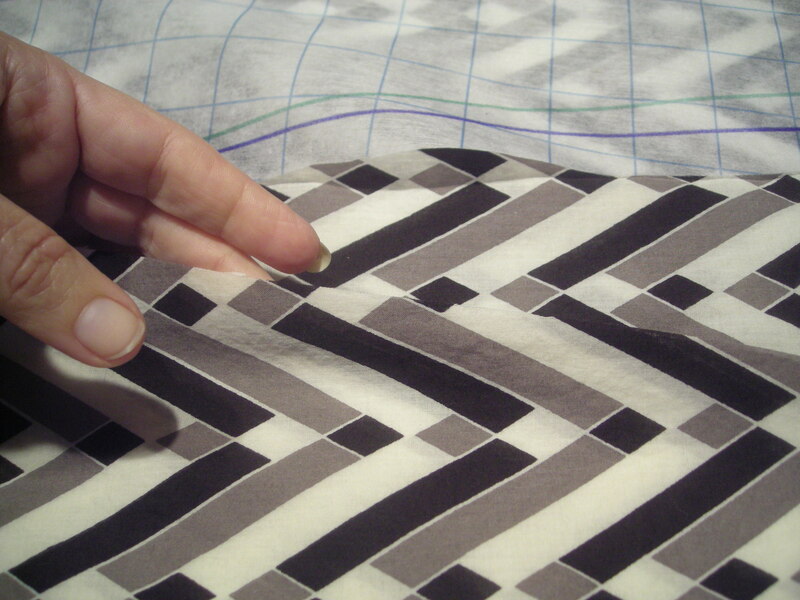 What tricks do you have for matching prints when cutting fabric?